The Pantheon, one of Rome's top tourist attractions, is located in Piazza della Rotunda, in the heart of the Centro Storico. The Largo Argentina bus and tram stops are just a couple of minuets away, with the nearest metro station, Spagna, being about a 15 minute walk. 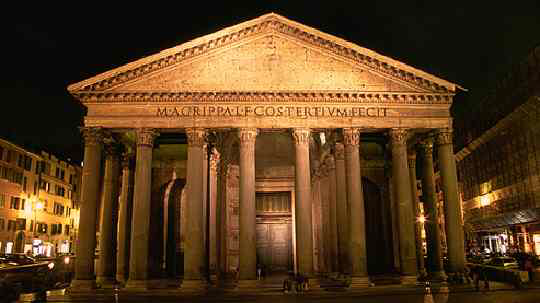 The Pantheon was built as a Roman temple and later consecrated as a Catholic Church. 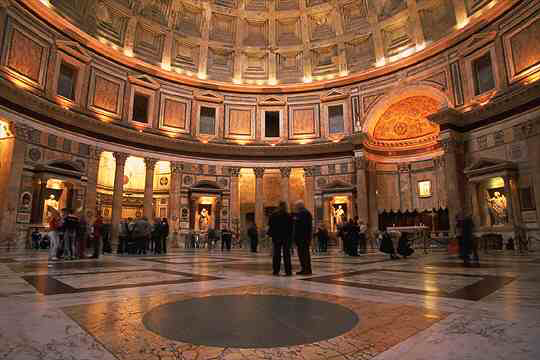 The original Pantheon was built in 27 to 25 B.C. during the third consulship of Marcus Vipsanius Agrippa, but was destroyed by fire in 80 A.D. Date stamps on the bricks indicate that the current building dates from about 125, and was built during the reign of the Emperor Hadrian. Although the building was totally reconstructed, an inscription that was on the original Pantheon was added to the facade of the new Pantheon. The inscription reads M·AGRIPPA·L·F·COS·TERTIUM·FECIT, "Marcus Agrippa, son of Lucius, consul for the third time, built this". The building was later repaired by Septimius Severus and Caracalla. In 609 the Byzantine emperor Phocas gave the building to Pope Boniface IV, who re-consecrated it as a Christian church, the "Santa Maria ad Martyres" or the "Church of Mary and all the Martyr Saints". A title that it retains to this day. The dome rests on a cylinder of masonry walls. Hidden voids and the interior recesses allows for a lighter construction, and giving an effect of not so much a solid mass, but more like three continuous arcades, which correspond to the three tiers of relieving arches visible on the exterior of the building . Originally, these exterior walls were faced with fine marble which, over the course of the centuries, has been removed. 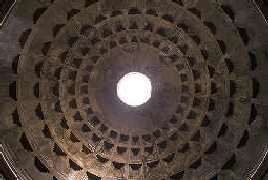 The dome itself is constructed through the use of stepped rings made from solid concrete with gradually less and less density the higher you go. To make this possible, lighter aggregate was used, including pumice, also the dome's thickness diminishes the nearer to the top you get.